Not quite what voters expected. 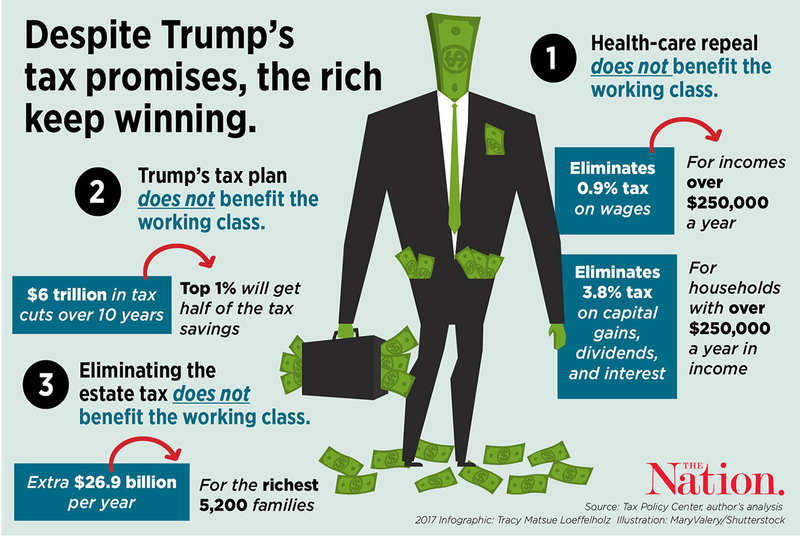 For all of his blustering promises to revitalize blue-collar work in America and “drain the swamp,” the central organizing principle of President Trump’s economic policy is cutting taxes for the rich. It’s the common thread that runs through his administration’s attempts to dismantle Obamacare, fund new infrastructure, and provide tax “reform.” But Trump’s lavish gifts to the wealthy aren’t just unfair to the rest of us: These policies will accelerate the worst trends in our economy, making them nearly impossible to reverse even if Trump is defeated in 2020. The health-care bill recently passed by the House is a tax cut paid for by reducing access to health care. The Republican plan will leave many poor and working-class Americans with less—and worse—care, because the GOP wants to repeal the tax increases that paid for President Obama’s Medicaid expansion. The GOP plan eliminates new taxes on capital gains, dividends, high-income earners, and health-insurance companies, cutting taxes by $600 billion over 10 years. To make that up, Medicaid will be rolled back, and people will be given less support to buy plans on the individual exchanges. States will be allowed to have plans that discriminate against preexisting conditions and cover fewer essential benefits. The problem that people have with the health-care system right now is that too many risks are shifted to individuals; to pay for the GOP’s tax cuts, ordinary people would be forced to bear even more of that risk. Trump’s lavish gifts to the wealthy will accelerate the worst trends in our economy, even if he’s defeated in 2020. Trump’s proposed tax plan is an even greater catalyst for inequality. Though there aren’t enough details to get specific—right now, his “plan” is only 100 words—the initial estimates are that it would cut taxes by $6 trillion over 10 years, with half of that going to the top 1 percent. One way to do that is by cutting the tax rate on “pass-through” businesses to 15 percent, a measure that would be sold as supporting small business. But what does this mean in practice? It would primarily allow well-compensated employees to turn themselves into mini-corporations that are then hired as contractors. Elite workers in finance, medicine, technology, and law would simply manipulate their employment structures in order to avoid income taxes and pay this favorable business rate instead. Needless to say, this won’t lead to any additional hiring or investment; it would simply allow people in these already elite occupations to shield themselves from public taxation. This too mirrors worsening trends in the economy. Employees are increasingly likely to have “nontraditional” relationships with their employers, either as contractors, part-time workers, or employees of a subcontractor. This fissuring of the workplace allows employers to push more risk onto workers while keeping more of the surplus for themselves. Now those at the top will also be able to enter into “nontraditional” work relationships, but for the sole purpose of hiding their income from taxation. Whereas the fissuring of the workplace weakens solidarity among ordinary workers, this fissuring at the top will produce a class of workers who can hide their wealth from any social claim. Trump also plans to eliminate the estate tax, which already has a generous $5.49 million exemption (up from 2016). This will ensure that inherited wealth goes into building aristocratic dynasties rather than contributing anything to the public good. Repealing the estate tax has long been a dream of conservatives, but its significance may be lost upon casual observers amid the GOP’s host of giveaways to the rich. The French economist Thomas Piketty argued in his acclaimed book Capital in the Twenty-First Century that we face a new era of inherited wealth and rapidly expanding inequality. Some critics doubted this prediction, assuming that a growing economy would naturally dilute the value of accumulated wealth. Yet wealth has a way of rewriting the rules to its benefit, and this tax code serves accumulation beautifully. The GOP has always championed lower taxes on the rich, and now we see this fixation overriding every campaign promise that Trump made to working-class people. His betrayal looks to be particularly grotesque, with an aristocratic elite propped up on the decrepit health care and deteriorating workplaces of everyone else.